We are supply Interactive AV System for Digital Class Rooms which are made of graded raw material. 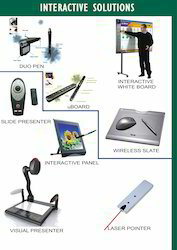 Our range of products include Interactive Slates and Interactive Boards. These systems are made using latest technology and feature long service life, quality and better performance. Available in many specifications, these Interactive AV Systems are designed to cater the requirements of clients. We offer them at unbelievable rates. 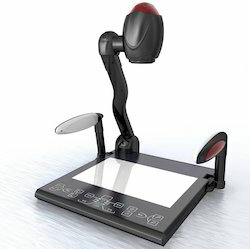 The Slide Presenter is an USB Presentation Controller is a great tool for professional presentation with Microsoft PowerPoint. You no longer need to stay next to your computer for clicking the keys while making presentation or have an addition person click the slides for you. 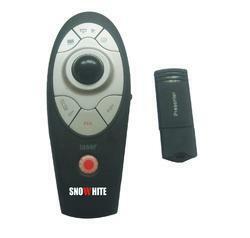 The remote mouse expands the control of your PC for more versatile operation. Walk freely around the room and focus on your presentation. 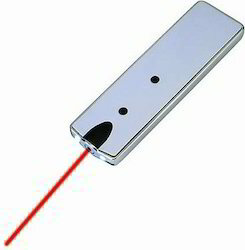 Laser Pointer is designed for the professional presenters. It has a clip for attachment to pocket, purse or notepad fo safe keeping and immediate access. Its unique design prevents from rolling off podium or table. The Laser Pointer has created a line or durable, high-quality laser pointers that can elevate your presentation to the next level. The laser Pointer is perfect for training and educational classes, conferences and seminars, sales presentation, construction projects, museum and art galleries, tour guides and many other applications. AverVision Visualizer is a digital presentation aid that allows to instantly displaying images of documents, 3D objects, and real-time movements through a monitor or projector. A visualizer eliminates the need to make photocopies for lesson plans, thus saving teacher’s preparation time and earth’s natural resources. Students can easily share their works with the class using a visualizer, boosting self confidence and creating excellent peer-to-peer learning. Designator for calss room & conferencing system application. Looking for INTERACTIVE SOLUTIONS ?